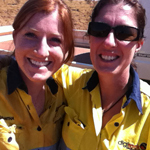 A barrage of negative press in early 2013 about the Fly-In Fly-Out lifestyle prompted the Women in Mining WA network to get on the front foot and launch an awareness campaign to highlight the positive aspects of FIFO work. 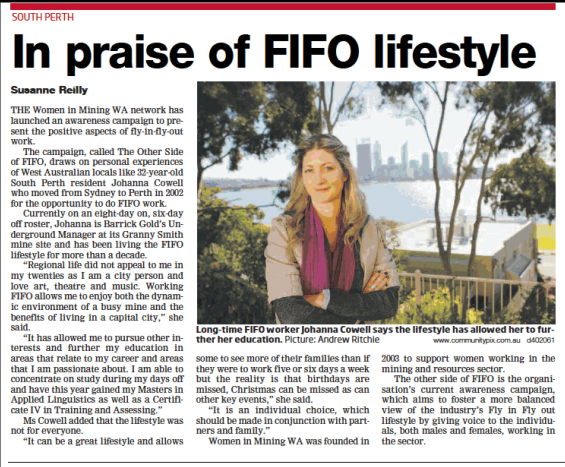 the campaign was launched in conjunction with a proactive media campaign which has seen media coverage presenting the positive side of FIFO work appear throughout the WA media, including The West Australian, The Sunday Times, Channel 7, and a variety of regional and local newspapers. The awareness campaign – The other side of FIFO – also sought to highlight the personal experiences of dozens of WA locals who are supporters of the lifestyle, and profiled a number of professionals from a range of mining and resource companies. Women in Mining WA (WIMWA) was founded in 2003 to support women working in the largely male-dominated mining and resources sector. The other side of FIFO is the organisation’s current awareness campaign which aims to foster a more balanced view of the industry’s Fly in Fly out lifestyle by giving voice to the individuals, both males and females, working in the sector.